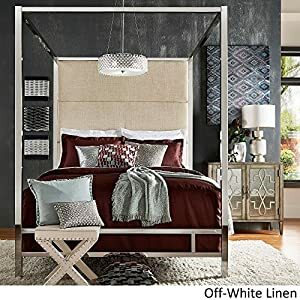 Best Canopy Bed Reviews: 10 Top-Rated Beds in April 2019! Have you ever dreamed of a beautiful bedroom, where you could feel like a king or a queen? Actually, to make your lovely room into a chamber in a palace doesn’t need too much effort. Buying a canopy bed would be enough. You may think that this small furniture stuff can’t blow a royal spirit into your ordinary apartment or house — however, it can, indeed. Two of my friends purchased these masterpieces for their wives (and one for his lover, by the way), and now they enjoy role-playing games and diversity if you know what I mean. So, obviously, women are more interested in supplying their home with such extraordinary furniture. However, as I mentioned before, men can get their benefit of this purchase, too. 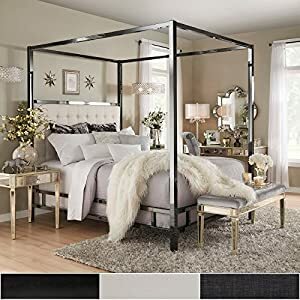 Basically, when you start thinking about bedroom decor, it is hard to find something as dreamy as a canopy-style bed. It is a great choice for those who want to add some romance and glamour to their dwelling. But don’t forget to buy a mattress pad for your bed. They aren’t expensive, easier to clean, and some of them even waterproof! 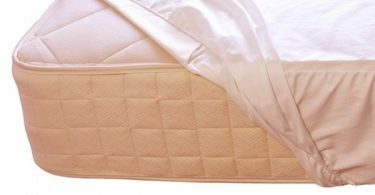 Here I made a list of the best waterproof crib mattress pads that are affordable and easy to use. At the same time, those who prefer minimalism can find a perfect solution too. Despite similar construction and style, different manufacturers make the products in different designs, size, color, and material so it can fit any apartment or house and any interior. So, what a canopy bed is and why it becomes so popular? 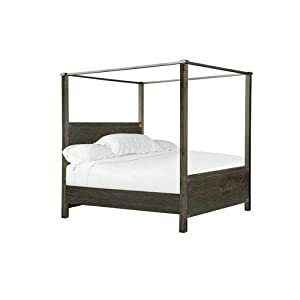 A canopy bed is a piece of furniture, which is made for sleep or rest, featuring posts at each of the 4 corners. These posts look like the prolongation of the legs and usually are covered with decorative fabric or ornate trimmings. This way, they create curtains and even a covering over the top, made of some beautiful cloth. This type of furniture first appeared in medieval Europe. Owners of palatial homes used to order canopies for privacy (their servants and attendants often slept in the same room). Additionally, they were protected from cold coming in through any crevices in the ceiling and walls and were able to keep the warmth longer. Until the 16th century these beds had pretty simple construction and finish, they were hardly decorated. However, soon craftsmen started to carved ornate design work on the posts and headboard, thus attracting more noblemen and their wives. It is interesting that in China a canopy bed was believed to be the most valuable piece of interior furniture at the beginning of 20th century. 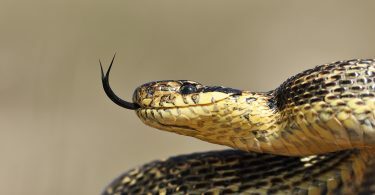 Moreover, in many cases, it was a part of the bride’s dowry. Chinese decorators and painters often decorated the posts with talismans of good fortune related to family happiness, fertility, and longevity. Nowadays these beautiful beds have become more and more popular. They are ordered by “Downton Abbey” fans, Hollywood celebrities and other rich and famous people. Little girls and teens also like them because this furniture has some royal spirit and they can feel like princesses when going to sleep or rest. Some furniture manufacturers even opened special workshops in order to develop and promote canopies. Basically, canopies are divided into two categories: traditional and contemporary. First ones are made of wood (metal frames are used in rare cases) and usually follow the Victorian style. The old-fashioned beds come with ruffled draping and heavy curtains and cloth. Modern ones look simpler and have the more universal design which can fit many American houses and or apartments. Their design is normally sharp without curved foot posts or anything, allows a metal and wood combination, and has minimum decorative elements. Universal styling in a warm finish and rustic-aged iron hardware provide an outstanding Abington so-called hospitable allure. This model represents the solid hardwood collection which is full of unique and quite useful details, such as built-in sliding doors or adjustable shelves. It will fit both loft and industrial interior. It will be perfect in an apartment in a big city. Additionally, it has suitable dimensions (89 inches length, 80 inches width, and 88 inches height) and would be great even for a small bedroom. This model features wooden frame and posts made from pine. They come with artificially aged iron metal stretchers which are placed between the posts. Nailhead accents and bolt-on-rails makes the construction solid and reliable. Is this bed comfortable to use? It requires minimal assembly. Multi-step finish prevents scratches and provides easy cleaning. However, it is not recommended to use chemical cleaners (especially, glass cleaners) and follow the instructions when use commercial cleaning products. Does it look good in the bedroom? 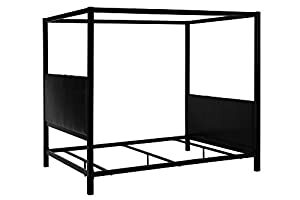 This Queen-size canopy poster bed comes with headboard, canopy, two side rails, and three metal slats included. It features durable and solid metal construction along with black nickel-colored finish. It will look great in any modern or vintage-styled apartment. According to the manufacturer, they follow modern trends to keep their customers’ interiors up to date. This item has a metal frame and metal posts. It features black nickel finish which is able to reflect the sunshine. It is also supplied with fabric-upholstered headboard in order to provide outstanding comfort. How comfortable is this bed? After ordering this model, you will require some assembly. Fortunately, you may use this iNSPIRE Q with an adjustable foundation. Although it is produced for one person, two people can easily sleep here as well. This King-sized model from Meridian Furniture brings elegance and good taste. It is 90 long x 71.5 wide x 78 high and would be great for both children and adults. 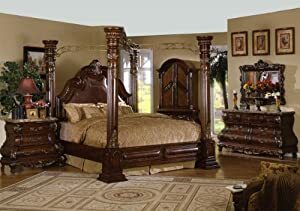 It has quite a high headboard, which is softly stuffed and covered by velvet fabric.. You can feel very regal lying on such a beautiful four-poster bed. The bed has a solid wood frame and posts . Its frame is upholstered in velvet fabric, tufted with crystal buttons and decorative details on the sides. Its expensive-looking finish and high-quality materials which give feel amazing when you touch them. This bed weighs 303 pounds, so it as to be carefully moved. There are instructions included on how to take care of velvet materials in case of accidental spillage of liquids. The designers of the Bermuda Queen bed canopy combined traditional British and old world “tropical” design. This shutter-styled model features turned posts and exclusive espresso finish made of high-quality veneers. The dimensions are 89.25 inches long, 63 inches wide, and 81.75 inches high. What is this bed made of? Both frame and posts are made from mahogany wood. The couch has a beautiful espresso finish, which highlights the elegance of the bed. It would be attractive in rooms with either dark or light colored walls. This one also needs to be assembled, but it does not appear difficult to do. The finish allows easy cleaning with water or other recommended methods. Mattress, bedding, and curtains can be chosen according to bed’s sizes. 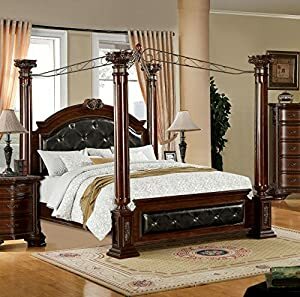 YYou will definitely appreciate this gallant bedstead which is desired by many rich people and those with good taste in interior furniture. The America Majestic model comes in a classic design and will fit any house where traditional style is dominant. This piece of furniture showcases four posters connected with a canopy. You can try different sizes of the mattress for its platform because there are several size options available. This is the high-quality sample of the furniture America produces. Check out its solid wood posters and frame as well as its corner-block construction. Although the platform is wooden, the canopy itself is made of scrolled metal. 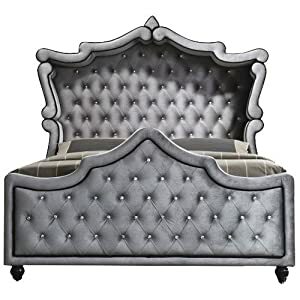 Both headboard and footboard are padded with leather which is tufted with buttons. This item needs to be assembled just like previous ones. One man can take care of this, however, two men could do it faster and with less backache. Please note that décor items may not be included in the box unless you specify them while ordering. How do you like this design option? 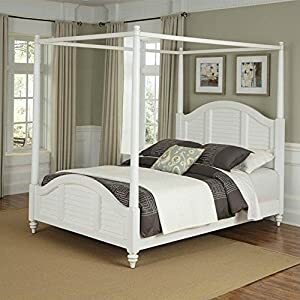 Bermuda Canopy Bed by Home Styles is one of those pieces of furniture which can make you proud of your income and good taste in interior trends. It features a shutter style and is patterned in an old world tropical design. Lying on this bed, you can imagine yourself as a Barbados governor or a senior living in the villa on a beautiful coast. This Bermuda model is made mostly from mahogany solid wood, which is widely known for its outstanding characteristics. There are also some details made from engineered wood. The product has an excellent finish, which makes the color more bright. Oh yes, it was made in Indonesia. Despite this fact, it is well-constructed and finished, some minimal care is required. You will have to assemble it but it shouldn’t take much time because clear instructions with pics are provided. Inland Empire Furniture’s canopy bed looks massive and expensive. It could really stand out in a president’s or monarch’s home. This piece of furniture features solid wood construction with a great finish and ornate decor. The king-size model has the following dimensions: 88.25 x 102.38 x 86.88 inches. The designers of the Inland Empire Furniture model used various materials in order to achieve its beautiful look. So, here you can see rubber tree, MDF, and some birch veneer (the last one was used for an alluring finish). Bonded leather was used in the headboard and footboard covering. Another attractive feature are bedside tables with marble (genuine, by the way) tops. Usage – good or bad? Besides bedframe, you get canopy, rails, and headboard. All these parts need to be assembled. Basically, if you are a man and have a standard kit of instruments you will manage to do it without any assistance. Do you want a statement for your interior that will catch the eye from the first sight? Evelyn bed canopy by Inspire Q would be a perfect choice. Surprise your wife, husband, partner, or guests with its gorgeous design, excellent finish, and extra tall headboard. Do I like the materials? This stunning model features chrome metal construction and gleaming metallic finish. You may also find some plywood details. The headboard is softened with a linen fabric fitted with foam. The material provides a tender touch and safe sleep. 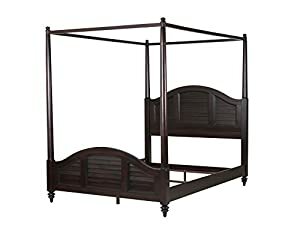 When ordering this item, you get not only a bedframe but also a headboard, set of rails, three metal slats, and a canopy. All that you will need after the assembly is done, are box spring, bedding, mattress, and linen (white, beige or grey will be preferable). Do you find it beautiful? Napa full-size model would be great for modern apartments or houses. Although it has quite a simple classic geometric design featuring clean lines, you will enjoy its tapered posters and cunning architectural details. Hardwood makes these bed canopies for adults very sturdy. Amazing finish makes it sleek and beautiful. You can place it in your bedroom at an affordable price and enjoy tender-to-touch materials every morning and every night. How do you like this bed? This piece of furniture is considered to be easily assembled. Even if you struggle and need to figure out how one part should be connected to another one, just read the instructions. The bed will be ideal for teens and adults. It can fit two people, providing amazing comfort. This DHP model showcases one of the simplest designs you can encounter among four-poster beds, However, it has many advantages which you may not notice at first. For instance, you can customize it according to your preferences. It allows choosing different mattresses, curtains, and bedding. And, finally, it fits both modern and classic styles. Made with a sleek metal frame, this elegant centerpiece of the bedroom is amplified by faux-leather material in headboard and footboard. It also has diamond stitching, which is very beautiful with the moonlight coming through the window. The manufacturer took care of your safey and confidence, providing additional center legs and rails for enhanced support. If you have kids, you can allow jumping on the bed. And if you have crazy dreams with your lover you can afford them, too. 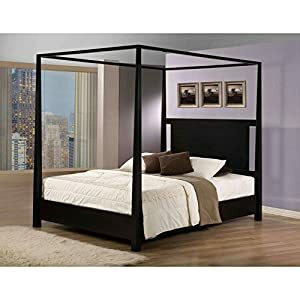 I hop, you will find my review helpful while looking for the best canopy bed for your home. I tried to research different styles and various models so that you can find exactly what you want. Check out these stunning beds made in 2018 and choose your perfect centerpiece of the bedroom.